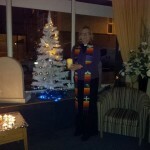 Lodge Brothers Windsor celebrated the lighting of their Christmas tree this week with a blessing carried out by the Reverend Rosie Webb. People from the local community were invited to attended the ceremony to see the tree blessed and to place tags on the tree with messages of remembrance to loved ones they may have lost in the past year. Branch Arranger Jill Palmer said, “At this special time of the year, it is lovely that anybody in our local community can come in and place a tag on the tree in memory of a loved one”. After the ceremony, mulled wine and mince pies were enjoyed by those in attendance courtesy of Lodge Brothers.